It’s that time of year again, when people in small towns all over this country lock their cars and their back doors to forestall neighborly gifts of summer squash. Here in the big city, we always lock our doors, and we have to pay real money for our zucchini, but we are probably still getting a bit tired of the elongated green gourd, and looking for something useful to do with it that doesn’t involve either frying it or dumping slices in the steamer basket. And as a college friend of mine once said, “Anything can be good and useful if it’s made of chocolate!” So, therefore, it’s time for chocolate zucchini cake. This recipe comes from King Arthur Flour’s Whole Grain Baking (Countryman Press, 2006; p. 426), and it’s the last of the King Arthur whole-grain recipes on my agenda until December. (I changed my mind about banana crunch cake and peanut butter cream pie, previously scheduled for September.) This cake has an unusual assembly method, as is often the case for cakes that incorporate fruits or vegetables, so let’s see how it came together. We start, of course, with the mise en place. The recipe calls for all traditional whole-wheat flour; I had a few ounces of whole spelt flour, and a fresh bag of sprouted whole wheat flour, both of which can be substituted for regular whole wheat (the total quantity is 10 oz or 280 g). 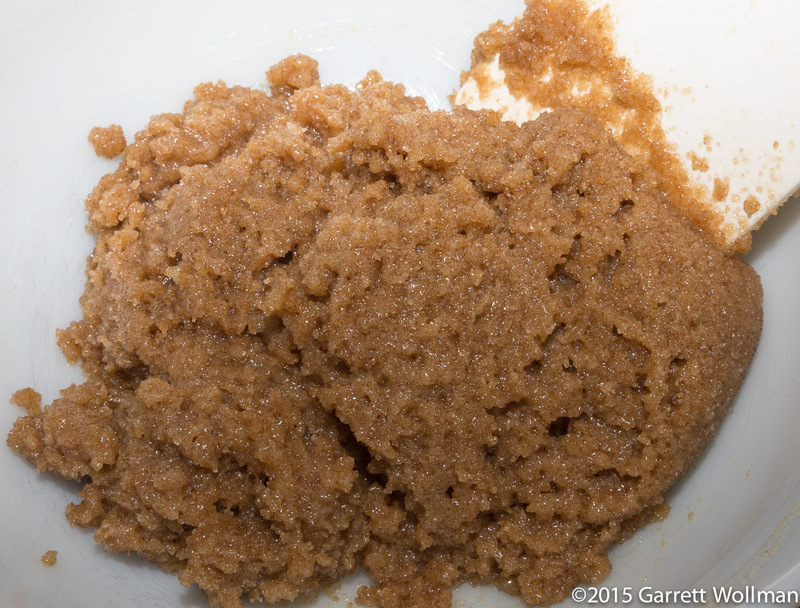 The leavening, which I added directly to the flour, is a teaspoon of baking powder, with a teaspoon of soda added to react with a half-cup of nonfat buttermilk that’s part of the wet works. Other dry ingredients include a half-teaspoon of salt, 6 ounces (170 g) of semisweet chocolate chips, and 1½ oz (45 g) of natural (not Dutch-process) cocoa powder. 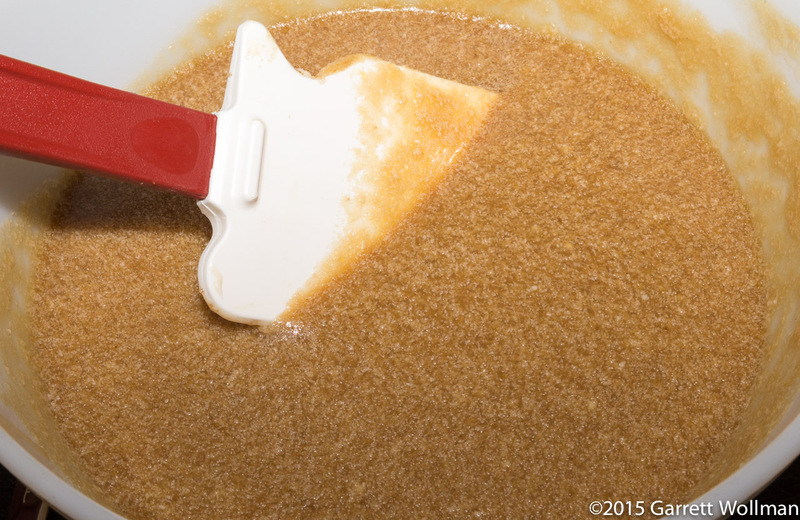 The wet team, in addition to the buttermilk, includes three eggs, 7½ oz (210 g) of light brown sugar, 3½ oz (100 g) of white sugar, and — most unusually — 4 ounces (115 g) of either butter or vegetable oil. If either butter or oil was acceptable, I figured melted butter must be acceptable as well, so I melted a stick of butter in the microwave, using the Pyrex bowl I intended to mix everything in anyway. Finally, there’s the zucchini. The recipe calls for a pound of shredded zucchini, but it also gives a volumetric measurement, two cups, and I found that two cups of firmly packed shredded zucchini, as measured using my Adjust-a-Cup measure, was actually more like 12 ounces (340 g) than a pound (450 g) — which was good, because it meant that I didn’t have to shred a fractional zucchini. Unlike many of the cakes I’ve done this summer, this one is not made by the creaming method — that would be impossible to do, if one were using the vegetable oil option, although I could have done it if I hadn’t melted the butter. Doing it this way allowed me to keep the flavor of the butter without having to wait for it to soften sufficiently to cream with the sugar — the result is obviously very different looking. Melting the butter liberates the water contained within, which dissolves a small fraction of the sugar, but mostly this still looks like a big lump of brown sugar. After mixing in the eggs, vanilla, and buttermilk, the batter is quite loose and looks a bit curdled — probably because the eggs and buttermilk were still a little cold, so some of the butterfat resolidified rather than being emulsified with the eggs. The dry ingredients are whisked together and added in two lifts, with the shredded zucchini in between, giving what is still a fairly wet, barely pourable batter. Chocolate chips are stirred in along with the second half of the dry ingredients. I chose to bake this cake in a 10-inch (250 mm) tube pan, previously lubricated with baking spray. It’s cooked for about 45 minutes in a 350°F (175°C) oven, until a tester inserted in the center comes out moist but clean. 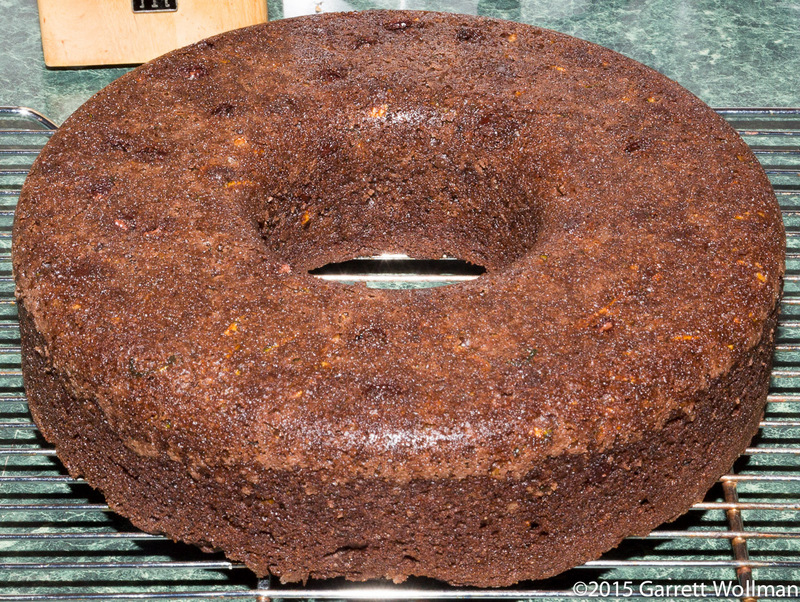 After cooling the cake in its pan for about 15 minutes, I turned it out onto the rack to finish cooling. A few of the chocolate chips stuck to the bottom of the tube pan, leaving voids in the top of the cake, but that will be fixed by covering the cake in a simple chocolate glaze — a ganache, in fact, made from 4½ oz (130 g) of chocolate chips, a half-cup (120 ml) of heavy cream, and a couple teaspoons of corn syrup (honey or glucose syrup would do as well). When I brought it in to work, I was the only person who could taste the zucchini. Most people quite liked it, and one taster raved. The zucchini did what it was supposed to do, imparting moistness and a soft texture to the cake without interfering with the chocolate flavor. 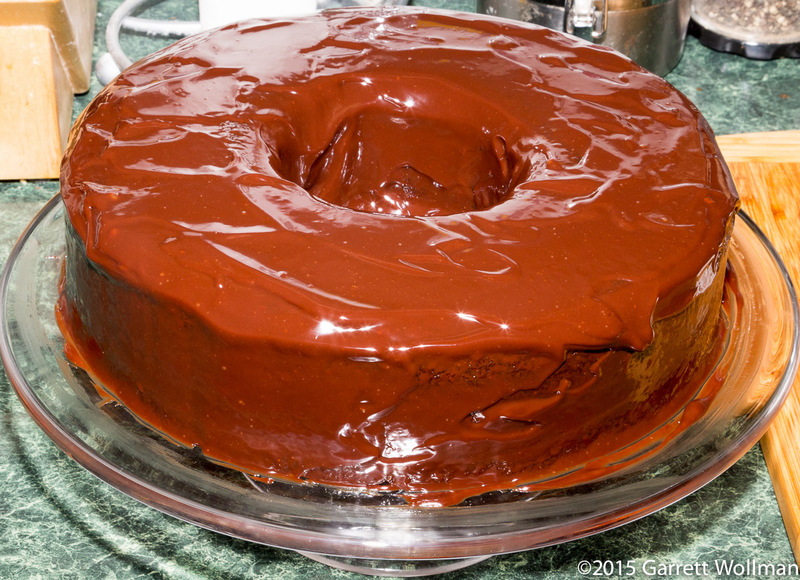 Unlike most tube cake recipes, this one is specified to make 16 servings (as opposed to 20). If you leave off the glaze, the servings are about 90 g each and 50 kcal cheaper. 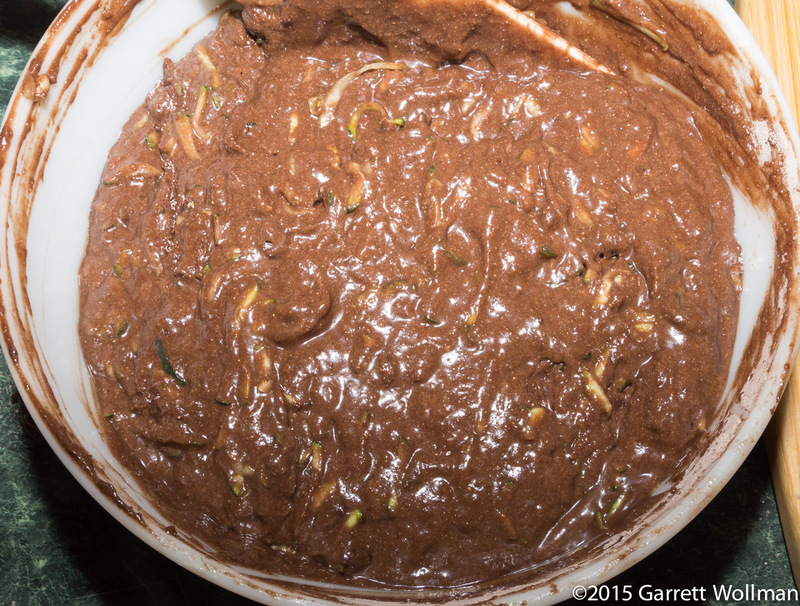 This entry was posted in Food and tagged cake, chocolate cake, King Arthur Flour, recipe, whole wheat, zucchini. Bookmark the permalink. Hopefully I was the one who raved; if not, ravers++!